Powerful Sales Results. Every Lead. Every Time. Are your sales results always awesome? Or do some months leave you wondering if you’ll be able to pay your mortgage? ​One of the most difficult parts of being a professional salesperson is managing the emotional peaks and valleys that accompany the ups and downs of sales. But according to Weldon Long, there is no challenge you can’t overcome, and he shows how salespeople can thrive in the face of adversity if they are just willing to create the right mindset and implement the right sales process—consistently. Unreliable performance and unpredictable results are likely, says Long, because you aren't doing the same thing consistently on every sales call. If sales activities are random, results will be random. 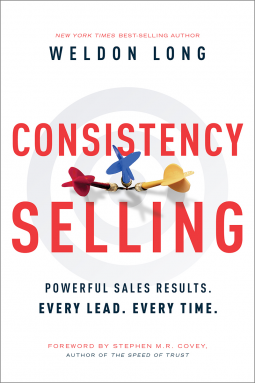 And random sales activities will never accidentally start producing consistent sales results, just as consistent sales activities will never start producing random results. It just can’t happen. Whether it’s a bad economy, a cheap competitor, bad leads, or a personal challenge, Long provides step-by-step advice on how you can make committed, consistent activities part of your daily sales routine so you will consistently be rewarded with the sales you deserve. Weldon Long is a successful entrepreneur, sales expert, and author, who—in 2003—walked out of a homeless shelter where he was living and within sixty months, had grown a sales organization to over $20 million in sales. —Dr. Willie Jolley, Hall of Fame speaker, best-selling author of An Attitude of Excellence and A Setback Is a Setup for a Comeback, and host of The Willie Jolly Wealthy Ways show on podcast and Sirius XM Radio. Anyone who is into sales would enjoy reading this book, it's well written, has simple practical tips and insights and provides creative solutions to challenges. I wanted to read it because I'm working on improving the sales of my books and this was just the right fit. Thanks Netgalley for the eARC.